Captain Drew has been with the squadron since 2007. 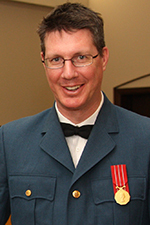 He has prior cadet and military background as member of 34 Squadron and 16 Service Battalion, Canadian Forces. Captain Drew is also the public affairs photographer for Saskatchewan. Captain Giesinger has been involved with 41 since 1998 as a Cadet, then Civilian Instructor, and now an officer. She has her glider pilots license and is a former Commanding Officer of 41 Squadron. Captain Drew served several years on the parents committee in various capacities including Secretary and Committee Chairperson prior to becoming an officer. Captain Drew has been with the Squadron since 2007. Captain Sweitzer has been a member of 41 for many years as both a cadet and an officer. He is a former Commanding and Deputy Commanding officer for 41. Captain Sweitzer is the coach of 41’s marksmanship team. 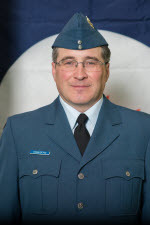 Captain Tumac, CD comes to us from 703 Squadron. As a member of the Vimy trip in 2017, Captain Tumac has joined us to familiarize himself with the cadets going on the tour. 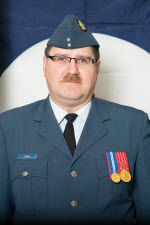 Captain Tumac has been the Commanding Officer of 703 Squadron and was previously an officer and cadet with 41. 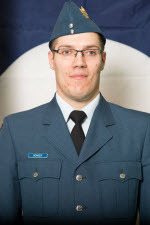 2Lt Kinneberg started volunteering with 41 squadron in 2009 and was commissioned as an officer in the Canadian Forces in 2014. He assists with curriculum instruction as well as flight & RC sim’s. 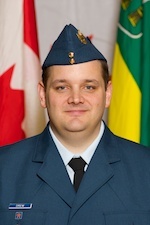 OCdt Senger was a volunteer with the squadron for two years prior to receiving his commission as an officer in the Canadian Forces in 2016. He assists with curriculum instruction and optional activities. 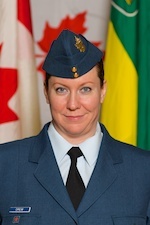 Ms Drew is a Warrant Officer First Class graduate of 41 Hercules Squadron. 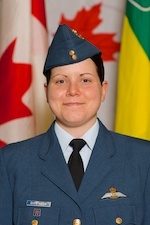 Since her graduation she has volunteered with 41 and 703 Squadrons in Regina as well as 691 Squadron in Indian Head. 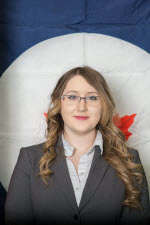 Ashley is in the process of enrolling in the Canadian Forces as an officer with the Cadet Instructor Cadre.